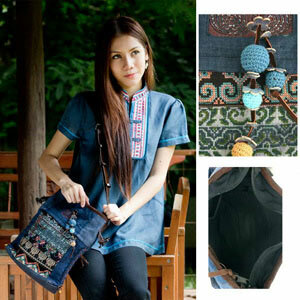 This delightful shoulder bag is handcrafted by Chirada Loetparisanyu with leather and cotton. 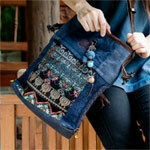 The front side features colorful patterns hand-woven and hand-embroidered by hill-tribe artisans. The interior is lined with cotton and hides three convenient pockets, one zipped to hold small items secure. There is an additional zipped pocket located on each side of the bag. The bag itself closes with a zipper and with a hoop over a dangling decoration. The dangling decoration features cute little flowers made of leather and knitted balls. Brass studs on the shoulder strap permits the length to be adjusted as desired. Materials: Cotton 90% and leather 10%.